by E. Summerson Carr, Ph.D. 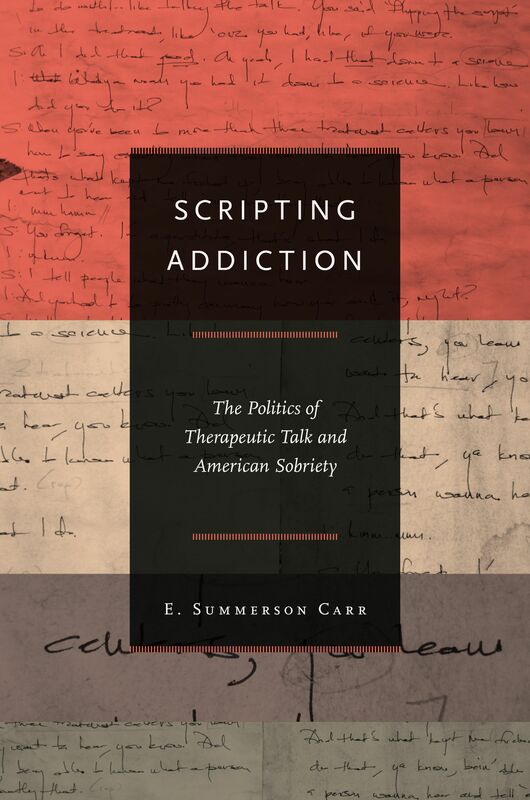 SCRIPTING ADDICTION: The Politics of Therapeutic Talk and American Sobriety, by E. Summerson Carr, takes readers into the highly ritualized world of mainstream American addiction treatment. It is a world where clinical practitioners evaluate how drug users speak about themselves and their problems, and where the ideal of "healthy" talk is explicitly promoted, carefully monitored, and identified as the primary sign of therapeutic progress. The book explores the puzzling question: why do addiction counselors dedicate themselves to reconciling drug users' relationship to language in order to reconfigure their relationship to drugs? To answer this question, Carr traces the charged interactions between counselors, clients, and case managers at "Fresh Beginnings," an addiction treatment program for homeless women in the midwestern United States. She shows that shelter, food, and even the custody of children hang in the balance of everyday therapeutic exchanges, such as clinical assessments, individual therapy sessions, and self-help meetings. Acutely aware of the high stakes of self-representation, experienced clients analyze and learn to effectively perform prescribed ways of speaking, a mimetic practice they call "flipping the script." In flipping the script, clients are able to secure needed resources from service agencies—just one of the ways, Carr argues, that therapeutic talk is fundamentally political. Carr’s detailed ethnographic account of Fresh Beginnings is grounded in a broader history of American addiction treatment. She argues that clinical routines in programs like Fresh Beginnings are shaped by the long-standing characterization of addiction as a “disease of denial.” According to this thesis, addicts are thought to lack the ability to clearly see and speak about their problems, a deficit that treatment is designed to ameliorate. Yet Carr shows how the idea of denial pits therapists and clients against each other and sustains troubled therapeutic relationships based on radical mistrust. Furthermore, she demonstrates that administrative processes—from the distribution of scant program resources to clients’ participation in program governance—are also affected by the theory of addiction as denial. As a clinical ethnography, Scripting Addiction examines how decades of clinical theorizing about addiction, language, self-knowledge, and sobriety is manifested in interactions between counselors and clients. As an ethnography of the contemporary United States, the book demonstrates the complex cultural roots of the powerful clinical ideas that shape therapeutic transactions—and by extension administrative routines and institutional dynamics—at sites such as "Fresh Beginnings." E. Summerson Carr is an Associate Professor in the School of Social Service Administration and an affiliated faculty member in the Department of Anthropology and at the Center for Gender Studies at the University of Chicago. Scripting Addiction will be of interest to scholars and students of social work, anthropology, and linguistics as well as clinical social workers and counselors in the field of addiction treatment. Scripting Addiction is available through Princeton University Press.